Images have long been a source of instructional material in English language teaching. Used traditionally with young learners in the form of flashcards and posters, images are nowadays easily available through digital technologies for all level classrooms. According to Wright (1990) pictures contribute to student interest and motivation, arresting the attention of even the most disengaged student; they are emotionally engaging and they offer opportunities for the expression of feelings and experience without having a right or wrong answer (9). Images build context, promote multi-sensory learning, and “reactivate target language” (Keddie 2009:9). Yet, although the ELT community largely agrees on their multiple benefits for language education, their systematic inclusion and exploitation tends to disappear in advanced level and exam classes (Wright, 1990:2). The discussion so far reflects a particular view of the function of images in the classroom: that of the occasional use in the form of a visual aid, which is there to enhance the practice of language skills or to enliven the teaching of grammar and vocabulary. The rest of the discussion seeks to explore how the approach to images in the ELT classroom is beginning to change in view of a literacy revolution known as multiliteracies pedagogy. The emergence of visual culture in the 21st century has brought students in daily contact with numerous image-texts in contrast to the predominance of print texts or oral texts that used to dominate educational contexts of the past. Increasingly “educators have looked at other sign systems such as those used in music, art, or film that could be used by students in a variety of subject areas” (Begoray, 2001:202). This complexity of semiotic systems that students of today need to learn to decode also demands multiple and new forms of literacy. A pioneering group known as the New London Group came together in the 1990s to propose a new set of priorities for literacy education now known as “a pedagogy of multiliteracies”. They proposed that the shifts in meaning making and representation that affected the sectors of “work, citizenship and personal life” in our era needed to also lead to changing attitudes to literacy teaching and learning (Cope & Kalantzis, 2009:166). Two concepts emerged as priorities: multilingualism and multimodality. According to the group, the forms of contemporary meaning are “increasingly multimodal, with linguistic, visual, audio, gestural and spatial modes of meaning becoming increasingly integrated in everyday media and cultural practices” (Cope & Kalantzis, 2009:166). To address these changing communication needs a pedagogy of multiliteracies is needed, where students would learn to “read and write multimodal texts” (166). Within the framework of multiliteracies pedagogy, visual literacy has emerged as an important priority for educational curricula. In the context of human, intentional visual communication, visual literacy refers to a group of largely acquired abilities i.e. the abilities to understand (read), and to use (write) images, as well as to think and learn in terms of images. According to an earlier definition, when we talk about visual literacy we talk about “the active reconstruction of past visual experience with incoming visual messages to obtain meaning” (Sinatra, 1986:5). 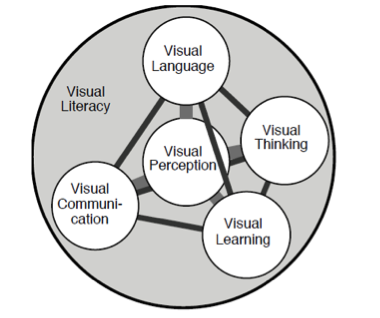 Despite the problems of definition, it is generally accepted that “visual language is a complex code that must be learned for true comprehension”, and that “the VL [visual literacy] skills are (a) learnable, (b) teachable, and (c) capable of development and improvement” (Avgerinou & Pettersson, 2011:8&9). These propositions constitute an important argument for the introduction of visual literacies skills into the curriculum; and indeed the new literacies manifesto has been highly influential, becoming the basis for the revision of many national curricula. The recognition that visual literacy needs to be integrated into the curriculum is not really news for curriculum designers. The influence of Howard Gardner’s (1993) theory of multiple intelligences (MI theory) has led to the recognition that instructional material should cater to different modalities, and should provide a variety of input in order to maximize learning. In the language divisions of education ministries in Canada, USA, Australia, and Singapore, for example, curriculum planning has moved on to the integration of two new skills next to the traditional language arts of reading, writing, listening and speaking; skills that promote multimodal literacy and make it an official part of the curriculum: viewing and visually representing. Viewing is an active process of attending to and comprehending visual media such as television, advertising images, films, diagrams, symbols, photographs, videos, drama, drawings, sculpture, and paintings. Representing enables students to communicate information and ideas through a variety of media. Examples of visually representing can include: a semantic or concept map, a graph or chart, photographs, computer-generated icons, drawings. Similarly in the revised English Language curriculum of Singapore, the traditional productive and receptive skills have been augmented with the two new skills of viewing and representing. And these are integrated with “Listening, Reading, Speaking and Writing to take into account the importance of developing information, media and visual literacy skills in the teaching and learning of EL” (English Language Syllabus, 2010:16). The learning objectives in the integrated reading and viewing skills include: students need to be able to “construct meaning from visual texts (e.g. pictures, diagrams, charts, icons, maps, graphs, tables)” (33), and “identify and analyse techniques (e.g. colour, pictures, sound effects) used in written and visual texts to achieve a variety of purposes” (39). Nearly every text that I look at uses two modes of communication: (a) language as writing and (b) image. Yet TESOL professionals continue to act as though language fully represented the meanings they wish to encode and communicate. Another researcher adds that “in fact it is necessary to redress the notion of support altogether in ESOL instruction such that the visual and the verbal can exist in classrooms reconfigured as multimodal complexities” (Britsch, 2009:712-713). These two voices from a leading journal in the field, TESOL Quarterly, encourage teachers and teacher educators to reconsider their views of communicative competence. As the concept of literacy is expanding to move beyond the three Rs reading and writing and arithmetic, and indeed beyond print to include the digital, the visual and the multimedial, educational systems and the TESOL world are starting to address these new literacy needs, and acknowledge that students need skills to evaluate and interpret still and moving image texts. Talks in TESOL conferences, address the use of iPads, films, digital storytelling, interactive whiteboards, GoogleMaps and so many other digital media. It is indeed exciting the way ICT has been embraced by the ELT community, as a useful tool that promotes engagement and new learning opportunities. But, although much attention has been given to digital tools which produce mainly visual media, visual literacy is largely ignored in TESOL conferences, often subsumed under the focus on digital literacies, revealing the overall misinterpretation of its changing role in the ELT field. The acceptance of a variety of forms of multimodal communication are evidence that we are indeed thinking intensely about the visual in the ELT world, but are we still thinking of it as support or aid? Then perhaps it is time to see it moving to center stage. As the new skills are introduced into the curricula of the future, how can we develop our own and our students’ viewing abilities? And what does knowing how to view mean? As with other skills, a helpful first move is to break viewing down to micro-skills. In order to hone our viewing abilities we need first of all to observe carefully. We can inspect, notice, visualize in our mind’s eye, analyze compositional relations, think about detail and ground, and then perhaps subsequently write a detailed description of our observations; this writing of a description often transforms itself into an intuitive interpretation and imagination. In this new literacy paradigm teachers need to receive training in visual literacy and media production. Indeed, it is suggested that teachers need to develop their own viewing and representing skills. We tend to think that being a good teacher is about having good oral skills, of being an effective speaker; and voice is indeed extremely important, but it seems that we additionally need to be “skillful in the visual domain” (Begoray, 2003:192). Aspects of visual literacy training need to be included in the syllabus of pre-service and in-service teacher training courses if we want to empower teachers in an era of multimodal communication and enable better collaboration with their students. Currently, in schools across the world, students are expected to interpret and present complex visual ideas, using a variety of multimedia applications without serious direct instruction. If it is true then that our world is full of powerful visual images that continually bombard our students, it is important to teach them to resist the passivity, apathy and numbness they might feel toward the visual, and instead help them analyze the rhetorical techniques and meaning making mechanisms in operation in visual texts – that is, to make them active viewers. The fact that the nature of contemporary communication has changed into a multimodal one, would lead us to rethink the construct of communicative competence. According to Royce “TESOL professionals need to be able to talk and think seriously about multimodal communication because they need to help learners develop multimodal communicative competence” (2002:192). By approaching images not merely as an aid, or support, but rather as a significant component of the experience of communicating in a foreign language, we help students slow down, look closely, reflect and take ownership of the image through writing, speaking and creating. These are all empowering practices that cultivate the 21st century skills of viewing and visually representing, which our students are going to need as citizens, future employees and life-long learners. In order for ELT teachers to be able to understand multimodal communication and help their learners develop multimodal communicative competence there is an urgent need for pre-service and in-teach training in the role of multimodality and visual literacy in language education. Argerinou, Maria D., and Rune Pettersson, ‘Toward a Cohesive Theory of Visual Literacy’, Journal of Visual Literacy, 30:2 (2011), 1-19. Avgerinou, Maria D., ‘Towards a Visual Literacy Index’, Journal of Visual Literacy, 27:1 (2007), 29-46. Begoray, Deborah, ‘Through a Class Darkly: Visual Literacy in the Classroom’, Canada Journal of Education, 26:2 (2001), 201-17. ———, ‘Integrating the Literacies of Viewing and Visually Representing with Content Reading’, in Integrating Multiple Literacies in K-8 Classrooms: Cases, Commentaries, and Practical Applications, ed. by Michael C. McKenna Janet C. Richards (Mahwah, New Jersey: Lawrence Erlbaum Associates, 2003), pp. 190-209. Britsch, Susan, ‘Esol Educators and the Experience of Visual Literacy’, TESOL Quarterly, 43:4 (2009), 710-21. Cope, Bill and Mary Kalantzis, ‘“Multiliteracies”: New Literacies, New Learning’, Pedagogies: An International Journal, 4:3 (2009), 164-95. Corder, Pit, The Visual Element in Language Teaching (London: Longman, 1966). Debes, John, ‘The Loom of Visual Literacy: An Overview’, Audiovisual Instruction, 74:8 (1969), 25-27. Donaghy, Kieran, Film in Action (Surrey: Delta Publishing, 2015). English Language Syllabus 2010 (Primary & Secondary). Ministry of Education Curriculum Planning and Development Division (2008). Goldstein, Ben, Working with Images (Cambridge: Cambridge University Press, 2009). Goldstein, Ben and Paul Driver, Language Learning with Digital Video (Cambridge: Cambridge University Press, 2014). Grundy, Peter, Hania Bociek and Kevin Parker, English through Art (London: Heibling Languages, 2011). Hill, David A., ‘The Visual Elements in EFL Coursebooks’, in Developing Materials for Language Teaching, 2nd Edition, ed. by Brian Tomlinson (London: Bloomsbury, 2013), pp. 158-66. Keddie, Jamie, Images (Oxford: Oxford University Press, 2009). Kress, Gunther, ‘Multimodality: Challenges to Thinking About Language’, TESOL Quarterly, 34:2 (2000), 337-40. Royce, Terry, ‘Multimodality in the TESOL Classroom: Exploring Visual-Verbal Synergy’, TESOL Quarterly, 36:2 (Summer 2002), 191-205. Sinatra, Richard, Visual Literacy Connections to Thinking, Reading and Writing (Springfield, IL: Charles C. Thomas, 1986). Wright, Andrew, Pictures for Language Learning (Cambridge: Cambridge University Press, 1989). Inside Out by S.Kay and V.Jones, Macmillan Heinemann, 2000.
face2face by C. Redstone and G. Cunningham, Cambridge University Press, 2006. Outcomes by H. Dellar and A. Walkely, Heinle, Cengage Learning, 2010. Hill chooses to ignore instructions about using the image given in the teacher’s book. 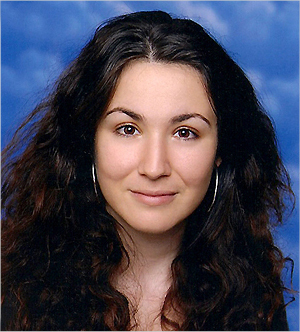 Dr. Sylvia Karastathi is a teacher educator and lecturer in TESOL at the Department of English Language and Language Teaching at New York College, Athens, Greece. She holds a PhD from the University of Cambridge, where she wrote a thesis on contemporary literature and visual culture, and an MA in Modern Literature and Culture (University of York). She has published in the field of word and image studies in The Museal Turn (2012) and The Handbook of Intermediality (2015) and her current research focuses on visual culture and visual literacy in language education. This entry was posted in articles, Uncategorized, visual literacy and tagged efl multimodality, efl visual literacy, elt multimodality, elt visual literacy, esl multimodality, esl visual literacy, language learning visual literacy, visual arts circle, visual arts efl, visual arts elt, visual arts esl, visual literacy, visual literacy education by kierandonaghy. Bookmark the permalink. Thank you Sylvia for this very useful overview of the current state of visual literacy in ELT. My day-to-day classroom reality is Cambridge ESOL exam preparation in which students are asked to give a personal response to photographs.. These images have been used by Cambridge for many years. While they were perhaps only initially included to stimulate oral language, the image is nowadays accompanied by a question requiring a more speculative response, often by including the word ‘might’. This does help the teacher work on speculation, personal response and may lead to critical thinking in classroom follow-up. It may be true that the speculative response question was initially an attempt by Cambridge to meet the objectives of the Common European Framework and ‘can do abilities’ at a more complex language level rather than develop visual literacy. However, there is a cross-over between the two areas of language production and visual literacy in ELT. I have seen this blogpost where there is an interesting video on Visual Thinking Strategies and some practical ideas on image response. ttps://www.edutopia.org/blog/ccia-10-visual-literacy-strategies-todd-finley. I think we need more of this, and agree with your point that there is a need for more teacher training guidance in visual literacy. I would suggest that Cambridge exam photo response would be a way-in to this for many TEFL teachers. It is the day-to-day reality of their classroom and we need resources that support this speculative response to images. Computer-based exams are now offered by Cambridge and I guess in the not-too-distant future the image response activity may even be based on a video clip. Thank you very much for your comments, Tim. It is true that still images in the classroom can allow space for speculation and personal response, as they are silent and motionless and encourage reflective thinking. Yet, a visually literate viewer would be able to move beyond speculation and point to what aspect of design or composition, theme or colour provokes a particular response. So, from speculation students could grow to a reasoned interpretation. This is not what the Cambridge ESOL, or the CEFR for that matter, are aiming at, but as exams are a huge motivational drive, I would agree with you that this is could be a good entry-point in which to include aspects of visual literacy in exam preparation settings. Your resource suggestion on Visual Thinking Strategies is a great one; a tool that can help teachers to promote thinking with images in the classroom, and making that thinking visible through classroom routines. Thanks for this great overview. Many of us in ELT are interested in images and have been trained in using coursebooks that, from my experience, have the typical ‘unit photo, followed by lots of exercises and the odd photo to add some context or just to liven up pages. I recently saw a great coursebook with no images and was not surprised that it hadn’t sold well. With all the interest in design and user experience in edtech, it’s not a surprise that we are starting to see ‘cooler’ texbooks but perhaps there should be more ‘leakage’ from the tech world. After all, some of the first apps and elearning were simply PDF books and copied exercises. As a coursebook utilising TED talks recently won an award, it seems logical that book writers should latch onto the edtechy multiskill world and creat mixed and blended skill activities in books to appeal to the ‘reading, texting, video watching, image cropping, image filtering’ generation. A more extreme response could just be to keep books as books and rely on this ‘books as physical objects’ kind of nostalgic market some have used now by making nice covers and emphasising the experience of bookshops and gifts as real world gifts and possessions. I also feel that the area of students and images is moving so fast as tech firms push forward that I as a teacher am probably quite far behind my students and what they use and think. Books, with their 3 years creation timeline, will be dated even after the first year and articles in much the same way. I can say that not just every year but every term is different in my uni as regards apps and even devices but what is clear is that images have become and will continue to be important, along with the video. Yet again, we are simply a few waves behind the tech world and the marketers in this case with their ‘images rule’ and ‘video marketing’ movements. From this angle, I see my students as customers of marketers as they latch onto whatever is ‘hot’ at the moment. As the purpose of marketers is to create needs and sell then I do wonder how much we have been influenced by decades of hoardings and magazines. These are interesting times form whicheer angle you come at it. Good luck with this group and well done for this first post. Coursebook producers are indeed welcoming the chance to integrate digital technologies in their products, as the tools to use them are, or will be soon, available in most classrooms. It is a way to renew the market and tap into the Generation Z demands. Yet for me, the important question, that should concern educators, is not, what types of images and videos the publishers are making available — which, as you correctly mention, have a rather short self-life in order to encourage consumption; but rather, what are the students doing in response to these images and videos? They could be doing very passive and low-order thinking activities e.g. watching and answering T/F questions with up-to-date exciting videos. Is this innovative, I wonder? A visual literacy component in education would support learners with tools, techniques, theories and examples to analyse, classify, critique, and create still and moving images in order to communicate effectively their own meanings. Focusing on these “viewing and representing” skills, and not on what is ‘cool’ at the moment, seems to me a priority, which is not dictated by market-driven forces, but by the skills needed to operate in an image-saturated world.